Rongai Route Kilimanjaro is a far less popular route to climb Kilimanjaro. 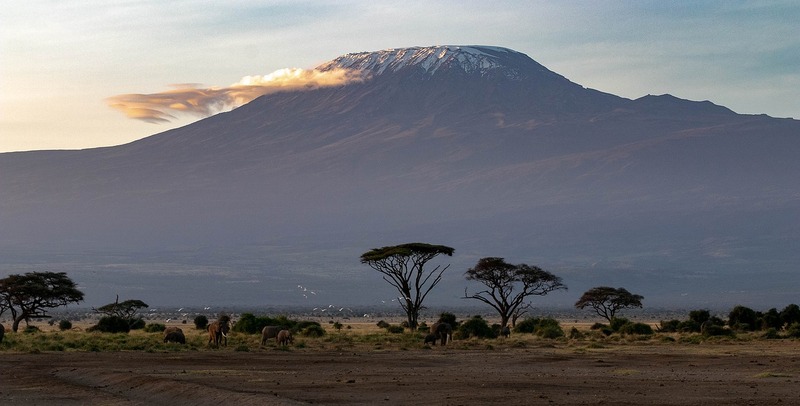 Starting from the North- east side of the mountain near the Kenyan border, the Rongai route up Kilimanjaro rises above the Amboselli plains and approached the summit of Kilimanjaro east of the Mawenzi peaks. The route is also known as Loitokok or the old Outward Bound Hut route up Kilimanjaro. It is an unfrequented route and in terms of difficulty is also the 'easier' camping approach to Uhuru Peak. The route approaches Kilimanjaro from the northern side at Loitokok Park gate over by the Kenyan side of the mountain after a long drive of about 4 hours from Moshi. The route heads through the forest on an unspoilt, remote and less popular trail as a direct approach towards Kibo huts. There are chances to see herds of Buffalo if you are lucky and you also get a chance to see a number of caves formed from the volcanic eruption of Kilimanjaro. However because of the constant altitude gain of the route does not allow for the application of the climb high and sleep low principle and hikers generally suffer more from altitude sickness along Rongai route compared to other routes. For this reason an extra day acclimatisation is advised. Rongai climb can be done in as little as six days but this yields lower success rates. Descent is made via the Marangu route. How long does it take to climb Mount Kilimanjaro on the Rongai Route? Rongai is done over as little as 6 days. The overall success rate is lower than the others because you have less time to acclimitise. Therefore is the best done over 7 days to add on one acclimatisation day and increase your changes of success. What distance does Rongai Route cover? When is the best time to trek along the Rongai? Is Rongai different to the other routes? Rongai, also known as Loitokok or the outward bound route, starts on Kenyan side of the mountain. There is very little rain forest on that side but it does tend to have more game. It is also very quiet. The 6 day version has no chances of acclimatisation so it is better to do it over 7 days. Do we stay in tents or huts on Rongai? How would you grade the trek along Rongai for difficulty? Our grade: Trek Grade: 2c (FP) along the Rongai. It is often ranked as easier along with Marangu but acclimatisation chances or less. Register at the Marangu park gate with a transfer (approximately 2 .5 hours) to the Rongai trekking start point. Meet your guide and porters before you begin your hike from the Nale Moru village at the start of the Rongai route. The small winding path crosses maize fields before entering a pine forest with a gradual climbs. The trail is not at all steep, but rather a gentle hike through beautiful country. The forest begins to thin out before you reach first cave later towards the afternoon. The first night&apos;s camp is at First Cave at about 2,600 metres. There is a toilet and a wooden table with benches, but no hut. Water can be found just down the trail below First Cave . The Rongai trail continues to Kibo with magnificent views of the Eastern ice fields on Kibo Crater rim. We will pass Second Cave (3450m) en-route, and start out across the Kikelewa moorlands under the jagged and imposing, Mawenzi peaks, reaching Kikelwa Cave at about 3600 metres. Overnight at 3rd Cave camp with magnificent Scenios nearby Kikelewa Caves . A short but steep climb up grassy slopes offering superb views of this wilderness area. Here, we will leave the moorland region behind and quickly enter into the lunar alpine desert stretched out between the imposing peaks of Mawenzi and Kibo. We will camp at Mawenzi Tarn spectacularly situated in the shadows of Mawenzi. Spend the afternoon acclimatizing and exploring the area. Wake at around 11pm and prepare for the summit ascent. This part of the hike is carried out early in the morning before dawn so that you reach Kilimanjaro Uhuru Peak around sunrise. After climbing steadily up a zig-zag path Gilmans Point lies ahead where you can get to see views of the crater from Gilmans Point. Another 2 hours of hiking will bring you to to Uhuru Peak (19,340 ft) at about 8:30 am, summit of Kilimanjaro. From there you trek back to Kibo Huts, collect your things and cross the vast plateau again at Horombo Huts to spend the night. After eating dinner, it is time for well-deserved sleep. Wake, pack and descend along the same route to Mandara Huts for lunch, before trekking down to the Marangu park gate to meet your transport back to Moshi. Those climbers who climbed to Gilmans Point (5700m) are issued with green certificates and those who reached Uhuru Peak (5895m) receive gold certificates for your Rongai Route climb on Kilimanjaro. There is very little forest to walk through so you miss the forest scenes. It is a direct approach route with little chance for climb high sleep low acclimatisation. There are several options to tag on a safari tour in either Tanzania or Kenya after your Kilimanjaro trek. The shortest safari is from 3 days to 9 or longer if you prefer.